The Sunil Bharti Mittal-owned Bharti Enterprises has a presence in a wide variety of businesses, but apart from telecom, it remains a mid-sized player in most of them. Five of the group’s seven unlisted ventures posted losses in the latest financial years for which data are available. Bharti Retail was the country’s fourth-largest retailer before its planned merger with Future Retail, while Field Fresh Foods, though growing fast, remains small. Ditto with Bharti Realty, Bharti Axa Life Insurance and Bharti Axa General Insurance. Five of the ventures made a combined loss of Rs 1,131 crore (Rs 11.31 billion) in 2014-15 on a revenue of Rs 4,655 crore (Rs 46.55 billion). This includes the revenue (premium and investment income) and losses of Bharti Axa Life Insurance and Bharti Axa General Insurance for the nine months ended December 2014. (See table). 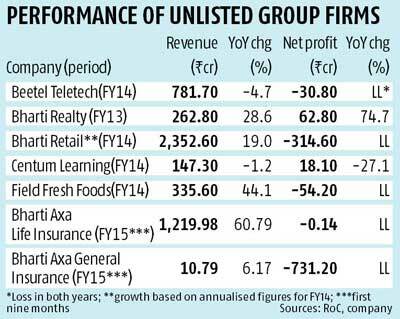 These figures pale into insignificance against the group’s scale in telecom. In 2014-15, the group’s two listed telecom companies, Bharti Airtel and Bharti Infratel, reported combined revenue and net profit of Rs 1.04 lakh crore (Rs 1.04 trillion) and Rs 7,176 crore (Rs 71.76 billion), respectively. 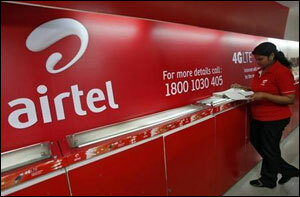 Bharti Airtel owns 71.8 per cent of Bharti Infratel, one of the world’s largest telecom tower companies. The analysis is based on data sourced from the Registrar of Companies. Data for all non-insurance companies, except Bharti Realty, are for 2013-14. Bharti Realty’s figures are for FY13 and data on two unlisted group firms, Gourmet Investments and Bharti Softbank Holdings, are not available. Bharti Axa General Insurance is the biggest laggard, reporting a net loss of Rs 731.18 crore (Rs 7.31 billion) during nine months ended December 2014 on revenue of Rs 10.8 crore (Rs 108 million). It is followed by Bharti Retail and Field Fresh Foods. Asked to comment, the group attributed the losses to the nascent stage of the non-telecom businesses and capital expenditure needed to establish their footprint. “It will be inappropriate to look at the non-telecom business ventures through the telecom lens. “Businesses have different growth trajectories and gestation periods. “It is, therefore, not appropriate to compare the growth and scale of the telecom business with other sectors,” a Bharti spokesperson said in reply to an emailed Business Standard questionnaire . He added the group was in the telecom business for 20 years, while most of the the unlisted ventures were five or six years old. Initial losses were common in long-gestation businesses such as retail, food and insurance, he pointed out. The group’s education and real estate ventures have reported profits, though. The education and training company, Centum Learning, reported a net profit of Rs 18.1 crore (Rs 181 million) and revenue of Rs 147 crore (Rs 1.47 billion) in 2013-14 and was debt free. Bharti Realty reported a net profit of Rs 62.8 crore (Rs 628 million) and revenue of Rs 262.8 crore (Rs 2.62 billion) during 2012-13. However, its balance sheet is stretched with a debt-equity ratio of 2.8 at the end of 2012-13. The company received a fresh equity infusion in 2012-13. Bharti Retail (now merged with Future Retail) reported a net loss of Rs 314.6 crore (Rs 3.14 billion) during the fifteen months ending March 2014 and has a negative net worth. The company reported a revenue of Rs 2,352.6 crore (Rs 23.52 billion) in 2013-14, up 19 per cent on an annualised basis over the 12 months ending December 2012. It is followed by Field Fresh Foods, which exports fresh food and manufactures and markets juices, sauces, pasta and ketchup under the Del Monte brand. The company reported a net loss of Rs 54.2 crore (Rs 542 million) during March 2014 on revenue of Rs 335.6 crore (Rs 3.35 billion). The company’s net worth remains positive due to an equity infusion of Rs 53.5 crore (Rs 535 million) in 2013-14. The Bharti group remains bullish about the prospects of its non-telecom ventures. “While telecom and tower infrastructure will continue to be the biggest verticals for the group, we see insurance, food and real estate as future growth opportunities,” the spokesperson added. The confidence stems partly from the finances of Bharti Airtel and Bharti Infratel. The promoters are likely to receive a dividend income of nearly Rs 300 crore (Rs 3 billion) from Bharti Airtel in 2014-15, up from around Rs 250 crore (Rs 2.5 billion) in 2013-14. Besides, the promoters raised Rs 1,859 crore (Rs 18.59 billion) by selling an additional stake in Bharti Airtel’s main holding company, Bharti Telecom, to Singtel in August 2013. The group said none of the other business ventures had investments from Bharti Airtel and they had no inter-se relationship. Bharti Enterprises runs each venture separately, and funding is independent of other business entities.